US Mint sales rose sharply last week. 74 products outperformed their prior gains as compared to the 26 reported in the previous US Mint sales report. Three new products supported the overall improvements. Debuting in the sales tables this week is the Mint’s most popular collector coin, the proof American Silver Eagle. Also added is the Grand Canyon National Park Five Ounce Silver Uncirculated Coin (see release details) and the Ulysses S. Grant Presidential $1 Coin Cover (see release information). The 2011 proof American Silver Eagle is the highlight, debuting with the best sales of the year. Collectors ordered $22 million of the coins between their launch on Thursday, June 30, through to Tuesday, July 5. The 367,623 unit total surpassed the same coin opening sales from 2010 and 2008. The proof American Silver Eagle was not produced in 2009. The Grand Canyon National Park Five Ounce Silver Uncirculated Coin was released one week ago, on Thursday, June 29. Their debut sales came in at 19,300, representing 71.5 percent of their maximum 27,000 mintage. The start is a bit slower than the openings for the three previous five ounce issues which honored Hot Springs, Yellowstone and Yosemite national parks. Those uncirculated coins eventually sold out in about two weeks. 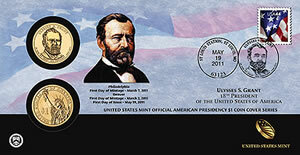 Ulysses S. Grant Presidential Coin Covers were also released Thursday. Collectors purchased 15,659 by Monday. The level is a bit higher than the previous Johnson release but lower than the inaugural sales of last years’ issues, as illustrated in the following table. *The as of date for US Mint sales of bullion coins is Wednesday, July 7, 2011 — except for the America the Beautiful 5-ounce Silver Bullion Coins which is Tuesday, July 5. For reference, 53,000 of the 2010-dated 1 oz Gold Eagles remained for sale earlier this year and are included in the overall totals. The bullion sales figures also include 469,500 of the 2010-dated Silver Eagle coins sold in January. The collector coin sales figures above have an "as of date" of July 5, 2011.